I’ve felt crummy for a bunch of years about mangling Frédéric Filliodeau’s name in my first Capital Dining guidebook. For one, I called him Philipe. Very rude. And – as if rechristening him wasn’t enough – I dropped an l and an i in his surname. This was in a 2004 report on Signatures Restaurant, back when it was the high end French restaurant of Le Cordon Bleu Ottawa Culinary Arts school, and Filliodeau (double l, two i’s) was its opening executive chef. He never grumbled (not to me anyway), and I’ve been looking for a way to make it up to him ever since. But Filliodeau dropped off my radar after leaving Le Cordon Bleu in 2006. Turns out he was at the Ottawa Hunt Club where he remained until last year, when he moved to the Sheraton Hotel Ottawa, replacing Executive Chef Russell Weir (now at Algonquin College). And that’s where I found him last week: at The Carleton Grill, a restaurant that’s also been off my radar for a long time. The room is handsome enough in a generic-hotel restauranty sort of way, blue in bits and red in bits, and a bit too bright all over. And on this Friday night, pretty much empty. This, just days after trying over and over again to score a table at the much hyped Mill St. Brewpub where the food’s pretty mediocre and the crowds likely know it but have found reason not to care. Which isn’t to suggest you all come here if you can’t find a pew at the pub. It’s hardly the same animal. 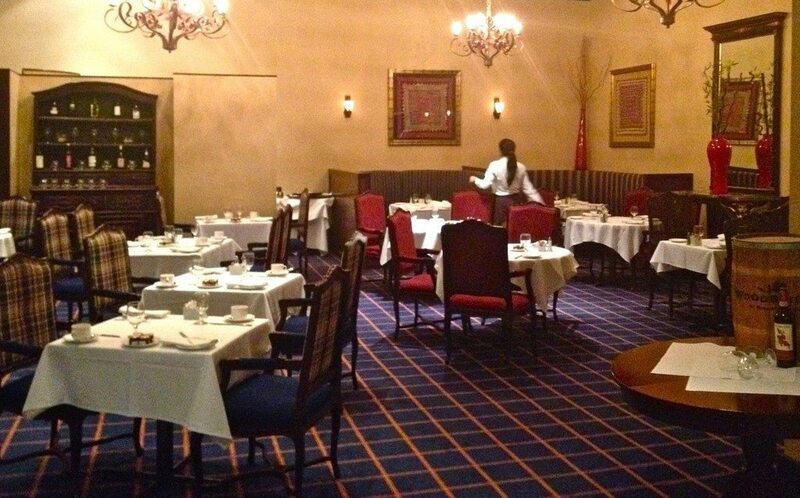 I only suggest this hotel dining room, now under Filliodeau’s care, ought to be busier. And I’m not just saying so to assuage my guilt. The menu is short, with safe, well-liked proteins – duck, steak, lamb, chicken, halibut, scallops, salmon – prepared in ways that remind you what a pleasure these favourites can be when beautifully cooked and thoughtfully assembled. And with delicious little turns. Are we not sick to death of Butternut Squash soup? And cappuccino foams? I thought I was, but not when the white cloud is scented with star anise and adds such an airy texture and low-fat lightness to a deeply flavourful bowl. Garlicked escargots and mushrooms… how yawningly ordinary? Not when tucked into a perfectly wilted baby cabbage leaf, the personality package set in a milky coriander sauce with pungent chives. Not a thing wrong with the Caesar salad – served in a well chilled bowl – the romaine perky, the dressing rich, balanced, the bacon chewy-good, the parmesan shaved for salty, textural interest. Main courses continue to impress. The chicken supreme has clearly been brined, for the thick slices are so very juicy,the skin crisped, the pale brown reduction jus delicate – the best breast I’ve had in a long time. The poached halibut is tender and creamy, set on a moist polenta cake studded with a spunky ratatouille. Circling the hill of cake and fish, some splendid little cherry tomatoes and shiny puddles of an olive oil emulsion infused with rosemary, thyme and fresh citrus. And finally, Mariposa duck, roasted to pink, the three essential components – juicy flesh, a thin layer of fat for flavour, crisp, well seasoned skin – in grand form, set on a thick, avocado-coloured sauce of puréed green peas with nubbly bits of smokey bacon. Next to duck and sauce, a little baked ‘tartiflette’ – an effortlessly delicious dish of Yukon Gold potatoes layered with bacon, onion, thyme, wine and cream, roofed with a Reblochon-like Quebec cheese (is it Belle de Jersey?) and baked to burbly brown. With the mains comes a side of interesting vegetables in superior form – hot, crisp, buttery. Yes, I’m afraid there was dessert. Two if we’re counting. The first a delicious trio of crème brulées – espresso, vanilla and caramel, served with a pistachio macaron; and a second more refreshing plate of pineapple, fanned out in carpaccio petals with a flower of lime sorbet painted with an exotic syrup infused with lemongrass. The Sheraton Ottawa suddenly has a superior kitchen. Now if the balance of the dining experience could please step up to meet it. I understand the wine list is under construction, but really, still a work in progress a week later and when I called no idea of when it would be presentable? Are the lights so bright to facilitate speedy evacuation? Candles at dinner would be awfully nice. Our server is very sweet, but knows very little. She should be selling this very good food (since the menu descriptions don’t) and in order to do that she needs to know it. And please remove the sugar packets from the table – you may have set for breakfast service already, but it’s 8PM and we’re here for dinner. Otherwise, this was a delightful surprise: fine French cooking is alive and well at Filliodeau’s Carleton Grill. That’s F-i-l-l-i-o-d-e-a-u. First name, Frédéric.